Neuschwanstein Castle in Bavaria, Germany has extraordinary paintings on the interior and exterior walls. Seven weeks after King Ludwig II's death the Neuschwanstein Castle was publicly open to tourists. People came from miles away to have a look at the amazing paintings and decor of the castle which was once kept only for King Ludwig's enjoyment. Fourteen rooms were fully decorated and designed with paintings portraying scenes from Richard Wagner's operas. The rest of the rooms at Neuschwanstein Castle were never finished before King Ludwig's death in 1886. This once privately owned castle has now become one of the main tourist attractions in Bavaria, Germany where daily guided tours are available. 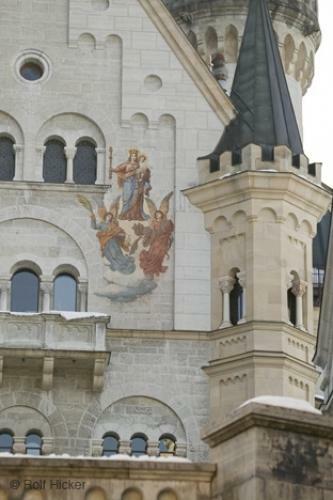 Photo of a painting on an exterior wall at Neuschwanstein Castle in Bavaria, Germany.